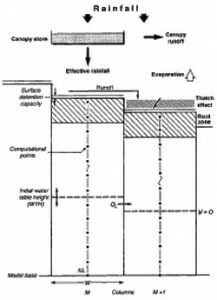 The fully coupled nature of CHASM means that the stability of a slope configuration (existing or proposed) can be investigated for a specific design rainfall In particular; the inclusion of unsaturated and saturated soil water conditions facilitates the direct influence of the dynamic pore pressures on slope stability. 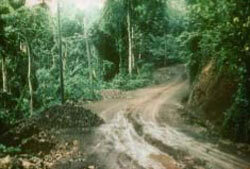 Road widening projects can be undertaken using both ‘design by precedent’ as well as by using CHASM. CHASM can be used in a pre-site investigation to undertake scenario testing for applications such as road improvement and Feeder Road construction. For example, it can be established whether negative pore pressures are maintained throughout a specified storm event; the impact of different initial groundwater and antecedent conditions on stability can be isolated; the role of vegetation in either increasing or decreasing pore pressures can be explored. Using CHASM thereby allows an initial appraisal to be made of the potential impact of a range of hydrological controls (either singly or in combination) on slope instability.